The title is not the only odd thing about the Keegan Theater’s latest show, “A Behanding in Spokane.” The play’s events are beyond unusual. The characters are absolutely bizarre. Carmichael (Mark A. Rhea) has been searching for his missing left hand for 27 years. Two sweethearts, Marilyn (Laura Herren) and Toby (Manu Kumasi), claim to have Carmichael’s hand. The cast is rounded out by a hotel clerk, Mervyn (Bradley Foster Smith) who is obsessed by the fact that he was cheated out of some money years earlier by someone he is sure is Toby. It spins a web of absurdity, relying totally on McDonagh’s delight in the outrageous and his ability to craft the improbable souls of his characters through their crazy, deluded speech and actions. Carmichael makes David Mamet’s low-life thugs look like choir boys. its radiator is almost completely chipped away. In addition to very capably directing, Colin Smith has created the perfect ratty environment for this play. There is little plot to “Behanding.” Its appeal is all in the way the characters interact. They ricochet off one another in various patterns of swagger, Carmichael always having the upper hand (no pun intended) because he’s the one with the gun. Kumasi has just the right blend of braggadocio and false humility, depending on whether Carmichael is in the room or not. 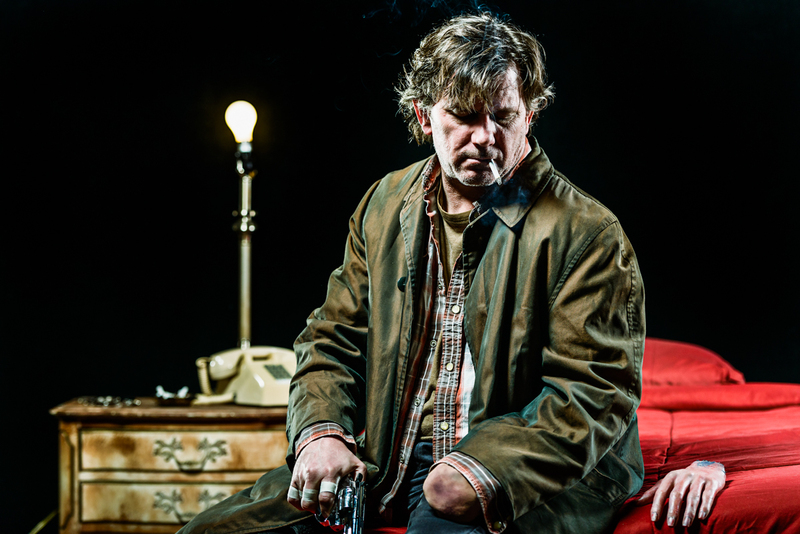 His rapid-fire, angry riffs while handcuffed to a pipe are among the high points of the play. Marilyn is the smallest part in “Behanding” but Herren plays it with just the right blend of piquant savvy and self-involved idiocy McDonagh intended her to have. His Carmichael is brooding and vile, arrogant and violent, yet there is a simplicity about him when he insists on telling the story of how “hillbilly detritus” caused him to lose his hand. It is his romantic explanation for a grimy, lost life. The best monologue is given to Mervyn, who tells the audience of his desire to be brave, to be heroic, despite the fact that he comes on like the frail Caspar Milquetoast. Smith’s portrayal of the pacific, loony clerk is delightful, especially when, at the last minute, he achieves his goal and becomes the hero of this raunchy, goofy expression of tension and small-time brinkmanship.